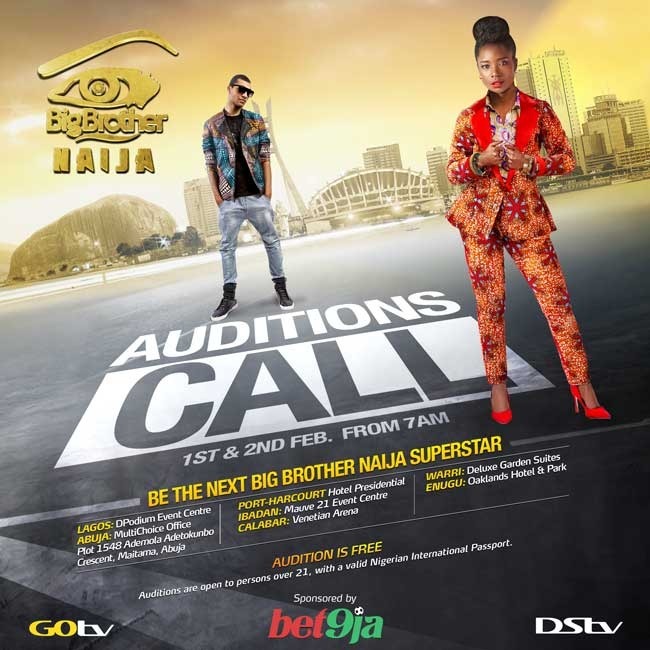 Nigerians interested in participating in the 2019 edition of the popular television reality show, Big Brother Naija, can now prepare to be part of it. Organisers of the annual event, MultiChoice Nigeria, a leading payTV platform in the country, have announced casting call for the programme. It was revealed that the Big Brother Naija, in its third edition this year, will be hosted by Betja. The last edition, which took place in 2018, was sponsored by Payporte Nigeria. MultiChoice Nigeria noted that auditions for the show will take place on Friday, February 1 and Saturday, February 2, 2019 across eight locations in Nigeria by 7am daily. The locations are D’Podium Event Centre, Off Adeniyi Jones, Allen Ikeja, Lagos; MultiChoice Office, Plot 1548 Ademola Adetokunbo Street, Beside NEMA Adjacent Transcorp Hilton, Abuja; Hotel Presidential, 5141, Aba Road, Port Harcourt, Rivers State; and Mauve 21 Events Centre, MKO Abiola Way, Ring Road by Adeoyo Junction, Ibadan, Oyo State. Other locations are Oakland Hotel and Park, Tunnel Crossing, Ogui Ring Road Behind Etim Plaza, Enugu; Deluxe Garden Suites, Bauchi Close, Shell Edjemba, Warri, Delta State; Venetian Arena, Plot 5 Murtala Mohammed Highway, Calabar, Cross River State; and Uyi Grand Event Centre, 11 Osagiede Street GRA, Benin City, Edo State. To be eligible for the show, intending contestants must be Nigerian citizens and over 21 years of age with a valid international passport. The Big Brother Naija 2019 reality show will be aired on the flagship platforms of MultiChoice Nigeria, DStv and GOtv. The last edition of the programme was won by Efe, who went home with the N25 million grand prize. By Dipo Olowookere The popular music.